Serious Moonlight follows Birdie, a mystery book lover who lives with her grandfather on Bainbridge Island. When she gets a new job at a hotel in Seattle, she runs into someone she thought (and hoped) she would never see again, but when he offers her a mystery to solve, she must decide if she should forget the past entirely, or build something from it. I love Jenn Bennett’s writing. This is no secret, and this book is no exception. It’s funny, cute, romantic, steamy, and really relatable. Jenn Bennett is my current contemporary queen right now because of how easy it is to devour her books. Her setting is also amazing. While I’ve never been to Seattle, I feel like I have after reading Serious Moonlight. This book is, at its heart, a coming of age and romance. While there is a mystery plot, it’s mostly sidelined for the character’s journey and I am 100% okay with that. I just didn’t care much about it. It was a little bit interesting, but the characters are what stole the show for me and made every scene so great. That said, the pace is still pretty fast and perfect for reading in one sitting. The characters are the focal point of this story and they deserve it. Birdie is a great protagonist, with a lot of growth to do while still being painfully relatable at time. I also really loved the medical aspect of her story. Birdie struggles with being open about her illness and debating whether or not to seek a diagnosis, and I really enjoyed how it was handled. Plus, it’s a specific illness that’s not really talked about. Daniel also has his own things to work through. His backstory was really unexpected but hit home for me. I don’t want to give it away, but it’s something that’s very close to me and I felt the way it was portrayed was really perfect. Also, I just really love Daniel. He’s a sunshine-y character but he has such great depth and personality. 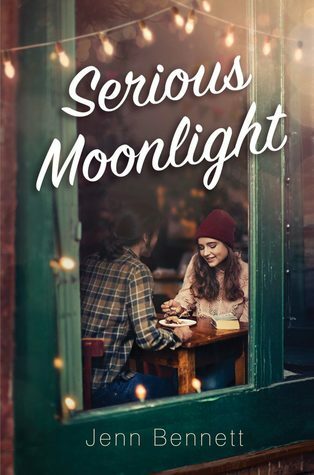 Serious Moonlight is the perfect romance that will have you searching for mysteries in your life.